FARMSTAR is continuously improving its precision service with its automatic variable rate application. Automatic variable rate application is an increasingly popular technology. It allows farmers to optimise their plot-specific inputs based on the actual needs of the plants and therefore manage their crops as efficiently as possible. potential gain with variable rate application. compatible with all displays formats (iso-xml, shape, rds, etc.). FARMSTAR allow farmers to realize variable rate application with or without special equipment. • Management with the variable rate application display. • Using GPS, the tractor's display controls the spreader and distribution. The farmer selects the equipment and fertiliser type. 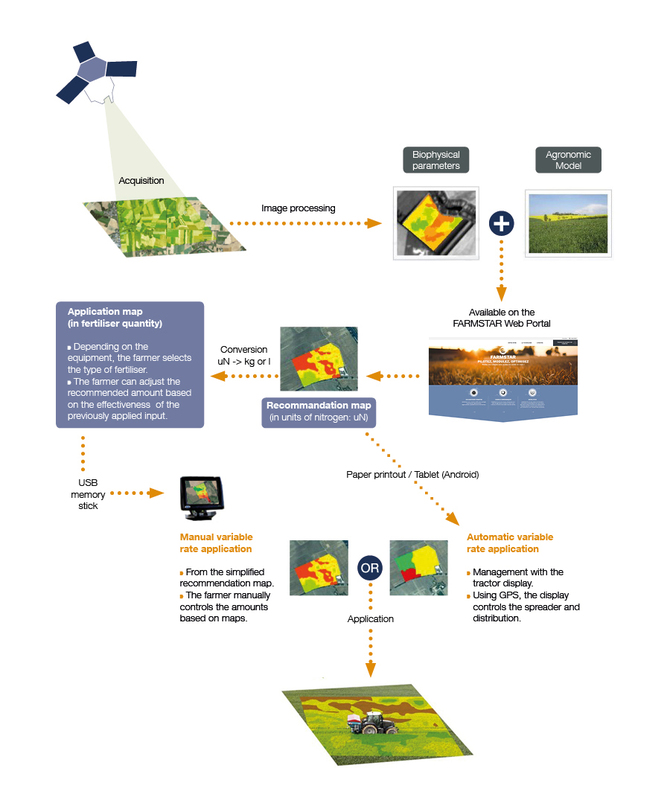 By entering the application map into the tractor's display, and using the GPS, the farmer can deliver the right amount of product to the right place in the plot. From the simplified recommendation map. The farmer manually controls the amounts based on zones. The simplified recommendation map (nitrogen or lodging risk) determines the plot's large zones where the farmer will apply more or less product. The farmer then manually carries out the spreading. The farmer can adjust the recommended amount based on the effectiveness of the previously applied input. Variable rate application files are available on FARMSTAR's secure portal. They can simply be downloaded to a USB memory stick or SD card to connect directly to the tractor's on-board, in the case of automatic variable rate application (compatible with display formats: shape, ISO-XML, RDS). Tutorials are available online, on FARMSTAR's secure portal. Fertiliser inputs adjusted to the plot: studies show an average gain of 3 q/ha. Variable rate application reduces the risk of pollution to the water table and streams. FARMSTAR continuously monitors new formats and new display versions to ensure 100% compatibility with all displays on the market. Risk of lodging on wheat and barley, 1-2 Nodes. These files will contain only the risks (low, medium or high) and must then be converted by the user into the product amounts on their equipment (not provided in the FARMSTAR application). Supply of nitrogen at the end of wheat bolting.